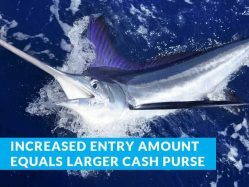 Palm Beach, FL: The 2017 Blue Marlin World Cup Championship Tournament could potentially be the richest ever, thanks to an increased entry fee. Teams will now pay $5,000 for the tournament’s base entry; the Big Blue Challenge, an optional jackpot for participating teams, will be set at $8,000 per team. “With these increases, which are the first in this tournament in over 20 years, the Tournament could produce a seven-figure winner if a participant wins both the Big Blue Challenge jackpot and the World Cup. While the Tournament has had strong participation in places like Hawaii and Bermuda, winners have come from all over the world. The winner could come from someplace like the Gulf of Mexico, North Carolina or the Bahamas as more participants fish in these areas. All of these hot spots compete on a level playing field in the battle to catch the World Cup winner. NOTE that entry fees must be paid in full by the event’s deadline of July 2, 2017, at 5:00 EDT. After June 19, 2017, only internet credit card payments will be accepted. The overall schedule for the Blue Marlin World Cup remains unchanged: teams will have the opportunity to fish for eight hours in their respective time zones around the world on July 4, 2017 in a winner-take-all format for blue marlin only. The largest fish will be declared the winner as long as it exceeds the tournament’s self-imposed minimum size of 500 pounds. The Blue Marlin World Cup is also a qualifying event for the Offshore World Championship. The winning team will have the opportunity to represent the tournament, as well as their home nation, during this prestigious invitation-only tournament in 2018. Another important aspect of the World Cup is the incredible growth of its social media platforms, including Facebook, Instagram and Twitter. Social media is an excellent way to communicate the activities of a worldwide event like the World Cup. Participants are invited to become more involved with social media to stay apprised of all things “Blue Marlin World Cup.” Photos can be shared in a variety of ways: via text message to Navarro directly, by email (fly@nullbluemarlinworldcup.com), and by ‘tagging’ the Blue Marlin World Cup on Instagram and Facebook. If you’re not already following the Blue Marlin World Cup, you’re invited to join any of these social media platforms in order to receive updates, news, photos and results from the event. Virtual spectators are also welcome to join in the fun by following the action, cheering for your favorite teams and being a part of sport fishing’s most unique billfish tournament.